I mentioned in one of my previous posts that I avoided the Brazilian polishes for awhile. The reason was I loved them all so much I knew one would not suffice. I decided I'd wait around until my birthday and do a little haul of them. This is one of them I picked up last month. It's one of the Hits Phenomena polishes, and it's pretty spectacular. 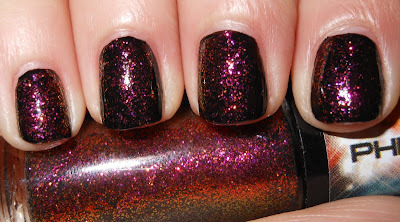 Air Glow is a multichromatic glitter that flashes pink, orange, copper and gold. This is a stunner people. I've seen some multichrome and duochrome polishes out there that you really cannot see there effect unless you are in certain lightning. This is not the case for Air Glow. This pretty shows all of its colors in any lighting. It is beautiful. This polish is definitely meant to be layered. I really would recommend you layer it over dark colors, it will bring out the depth of all the colors the best. I got this one on Ninja Polish. This is absolutely stunning!! I love it on you! Very pretty & perfect for fall! Super pretty! 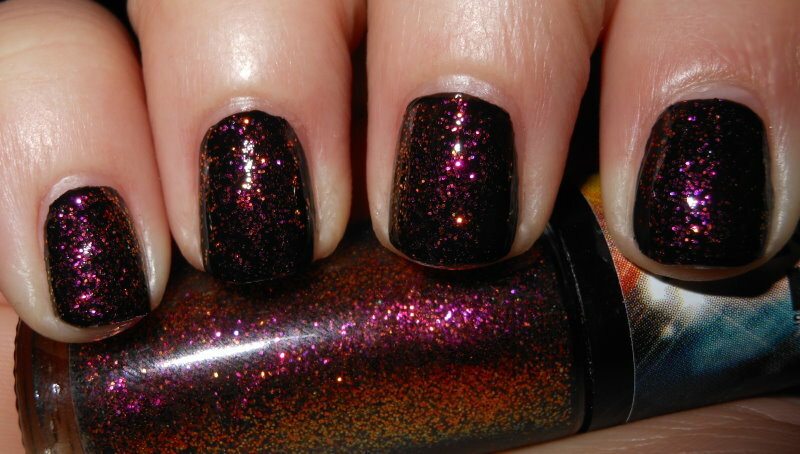 Reminds me of a glittery version of MAC's Bad Fairy. I don't have any HITS polishes....you're making me feel like that needs to change. So pretty!